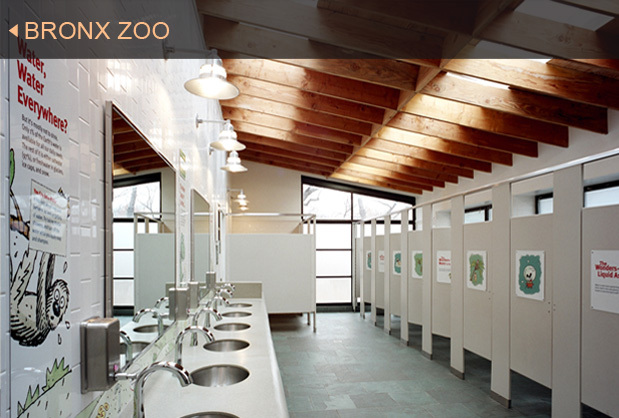 Green Building, Green Building Projects, Bronx Zoo Eco-Restroom, Clivus Multrum Inc. The Bronx Zoo has been educating and entertaining visitors since 1899. The Zoo's 256 acres makes it the largest urban zoo in the United States. It hosts two million visitors annually and is home to more than four thousand animals. Owned and operated by the Wildlife Conservation Society, the Zoo has a strong focus on environmental conservation. That focus has been applied to an interest in sustainable building practices at the Society's zoos. Restrooms near the Bronxdale entrance needed replacement due to a failing septic system. A new septic system at the site was rejected due to concern over the potential for pollution to the nearby Bronx River. A sewer connection was considered but was also abandoned due to the huge cost of tunneling under the Bronx River Parkway. Instead, the Zoo decided to install Clivus Multrum Composting Toilet Systems. In addition to saving money, the Clivus systems capture and recycle the nutrients in human waste and use only minimal water for flushing. The Eco-Restroom accommodates more than ½ million visitors per year. Foam-flush toilets use only 6oz. of water per use, resulting in a savings of more than one million gallons of water each year, as compared to conventional low-flow (1.6gpf) toilets. Because the Eco-Restroom also includes a greywater irrigation system, the building manages all of its wastewater sustainably, onsite. The use of these technologies and others, including a rainwater harvesting system, maximized natural daylighting, and efficient radiant floor heating, contributed to the Eco-Restroom being named New York Construction's 2007 Eco Project of the Year.